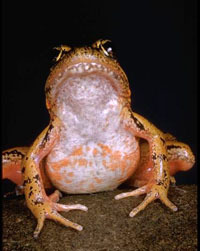 The California red-legged frog, endemic to California and Baja California, Mexico, is the largest native frog west of the Continental Divide. The feisty hero of Mark Twain's tale The Celebrated Jumping Frog of Calaveras County was a red-legged frog. Once so common it was a staple cuisine in San Francisco and the Central Valley, the frog’s numbers have plummeted to near extinction in recent decades. Threats to the species include loss and degradation of wetlands and riparian habitat due to urban sprawl, agricultural expansion, wetland draining, dams and water diversions, logging, cattle grazing, pesticides, and introduced bullfrogs. Red-legged frogs still persist in small numbers in drainages in the Sierra San Pedro Martir in northern Baja California, Mexico. • The Center won protection of the red-legged frog as a threatened species under the Endangered Species Act in May 1996. • A development industry lawsuit in 2002 set aside the frog’s critical habitat and removed protection from all but 199,000 acres. The Center intervened in the lawsuit and forced re-designation of critical habitat. The United States Fish and Wildlife Service released a series of proposals beginning in 2004, first reinstating the original 4.1 million acre designation and then slashing it down to 450,228 acres in 2006. The Chiricahua leopard frog inhabits permanent aquatic habitats with abundant vegetation in Arizona, New Mexico and Mexico. This leopard frog has declined more than any other leopard frog in Arizona and is extirpated from almost half of its historical occurrences in the United States. It is threatened by habitat destruction and alteration due to drainage of aquatic habitat, river channeling, damming and grazing; as well as by introduced predators and UV-B radiation caused by ozone depletion. This olive green frog with charcoal leopard spots can still be found in Mexico through the Sierra Madre and Chihuahua. • The Center submitted a petition to list the leopard frog under the Endangered Species Act in 1998. • A Center lawsuit resulted in an endangered listing for the leopard frog in 2002 throughout its range, including northern Mexico. The three-inch long arroyo toad was once found throughout coastal rivers and streams in southern and central California, south to Baja California, Mexico, in the vicinity of San Quintin. Toads hatch in a river or stream and begin to develop in water; adult toads live on land, where they forage for insects and dig burrows on sandy terraces. Arroyo toad populations have suffered from damming of streams and siltation, degradation of habitat from urban development, cattle grazing, mining and off-road vehicle use. Arroyo toads now survive in only 22 small, isolated headwater streams . • A legal settlement obtained by the Center resulted in designation of more than 182,000 acres of critical habitat for the endangered arroyo toad in February 2001. • After habitat protections were removed following a building industry lawsuit, Center intervention in the case resulted in a new critical habitat decision for the toad in 2005. The mottled coqui frog inhabited the forested interior uplands of Puerto Rico. It paid the ultimate price for bureaucratic delays to protect the frog under the Endangered Species Act. The mottled coqui frog went extinct in 1990 while waiting unprotected on the “candidate” list. • In November 2005 the Center filed a lawsuit challenging decades of delay in providing protection for 283 species under the Endangered Species Act, including the mottled coqui frog. The coqui guajon, also known as the Puerto Rico rock frog, is a rare frog which occurs only in Southeastern Puerto Rico in the municipalities of Maunabo, Yabucoa, San Lorenzo and Humacao. The guajon occurs in caves and rock grottos known as “guajonales.” The guajon is the only one of the Puerto Rico coqui species to occur in caves and grotto formations. There were originally 16 coqui frog species in Puerto Rico, but three are believed to be extinct today, and many of the remaining 13 are believed to be rare or declining. The coqui guajon was listed by the U.S. Fish and Wildlife Service as Threatened under the Endangered Species Act in June 1997. • The Center filed a lawsuit in June 2003 to compel the U.S. Fish and Wildlife Service to designate critical habitat and prepare a recovery plan for the coqui guajon. • In February 2004 the Center won Endangered Species Act protections for the frog when the Service agreed to prepare a recovery plan for the coqui guajon by November 2004 and make a critical habitat determination for the species by September 2006. Oregon spotted frog, WA Dept. The Oregon spotted frog originally occupied warm wetlands from southern British Columbia to northern California. 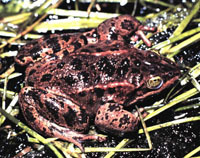 The Oregon spotted frog has been hard hit by fragmentation of its habitat, and the majority of remaining populations are imperiled by development, gravel mining, water diversion, livestock grazing, introduction of non-native plants and animals, and water contamination from pesticides, fertilizers and acid rain. In British Columbia, it has received an "emergency listing" as an endangered species, the only such listing in Canada’s history. The U.S. Fish and Wildlife Service added the species to the candidate list in 1991. Since then, its habitat has been lost at an accelerating pace. The frog has now disappeared from up to 90 percent of its former range. • In May 2004 the Center petitioned for protection for the Oregon spotted frog and other candidate species under the Endangered Species Act. • Read the Center petition for the Oregon spotted frog. The Mexican garter snake is an aquatic snake found in Arizona, New Mexico and Mexico. Its primary habitat is in riparian areas with permanent water, dense vegetative cover and an abundance of native prey, including fish and leopard frogs. Populations in Mexico are poorly studied, but threats to its habitat are thought to include livestock grazing, urban development, groundwater pumping, exotic species and illegal collection and persecution. • The Center petitioned for Endangered Species Act listing of the garter snake in December 2003. The non-venomous Lake Erie watersnake lives among the near-shore and offshore islands and in the waters of the western Lake Erie basin of Ohio and Canada. The Province of Ontario, Canada designated the Lake Erie watersnake as an endangered species in 1977. Small population size, persecution by humans, and habitat destruction are the primary threats to the watersnake. • The Center won Endangered Species Act protection for the snake in August 1999. 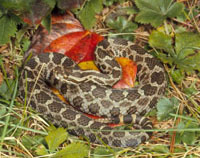 The Eastern massasauga is a wetland rattlesnake of the Midwest and Great Lakes, including Ontario, Canada. It is a thick-bodied snake, 18- to 30-inches long, with large brown blotches on its back and smaller lighter brown patches on its sides, generally docile and unlikely to bite unless handled or threatened. It was placed on the federal candidate list for Endangered Species Act protection in 1982. During the 22 years it has been awaiting protection, its habitat and population numbers have continued to decline and it is now extirpated from 40 percent of the counties it historically inhabited due to wetland losses from urban and suburban sprawl, golf courses, mining and agriculture. • In May 2004 the Center petitioned for protection for the Eastern massasauga and other candidate species under the Endangered Species Act. • Read the Center petition for the Eastern massasauga. The flat-tailed horned lizard is an attractive lizard that looks like a miniature dinosaur and lives in the Sonoran Desert of Arizona, California and northwestern Mexico (Sonora and Baja California Norte). As the common name suggests, the species is recognized by its broad, flattened tail but also has long, sharp horns on its head, two rows of fringe scales along its abdomen and a dark stripe along its backbone. Flat-tailed horned lizards feed primarily on native harvester ants. The main cause for the decline of the lizard is conversion of habitat to urban sprawl and agriculture. The U.S. Fish and Wildlife Service issued a proposed rule to list the species as threatened in November 1993, but withdrew the proposal in July 1997. • The Center filed a lawsuit in October 2003 challenging the Service’s withdrawal of the proposal to list the flat-tailed horned lizard. • A federal court in August 2005 ruled that the withdrawal of the proposed rule violated the Endangered Species Act, and restored the proposed listing. The United States proposes to construct a new American military base off the Japanese island of Okinawa, atop a healthy coral reef that supports numerous species threatened with extinction, in an area dubbed the “Galapagos of the East” because of the variety of marine species. Three imperiled species of sea turtles – the hawksbill, loggerhead, and green turtle – rely on habitat in this area. All three types of turtles are listed under the U.S. Endangered Species Act and the global Convention on International Trade in Endangered Species. Turtles use nearby beaches to feed and to lay their eggs. The new base will cause pollution, create harmful artificial lighting in the area, and increase human activity – all of which jeopardize sea turtle reproduction. • The Center joined Okinawan environmental and cultural groups to file a lawsuit in September 2003 against the U.S. Department of Defense and Defense Secretary Donald Rumsfeld to halt the airbase construction project. The leatherback sea turtle was listed as endangered throughout its range in 1970. Leatherbacks nest in Mexico and Costa Rica in the eastern Pacific, and in Malaysia and Irian Jaya in the western Pacific. There were an estimated 126,000 adult female leatherbacks in the eastern Pacific alone in 1980; now there are less than 3,000 leatherbacks of both genders left in the eastern Pacific, while the western Pacific nesting populations have been devastated to near extinction. Leatherbacks face significant threats from “incidental take” in commercial fisheries. Drift gillnet, set-gillnet and longline fishing are destructive practices that result in the unintentional capture, harm or killing of thousands of sea turtles and other marine animals by commercial fleets annually. Longlines, monofilament lines up to 30 miles long with thousands of hooks, ensnare leatherback, loggerhead, olive ridley and green sea turtles, and entangle thousands of seabirds, such as albatross, and tens of thousands of sharks each year. The Center’s efforts have led to the shutdown of several harmful fisheries along the California coast and stretching far into the waters off California and Hawaii, protecting highly endangered leatherback and loggerhead sea turtles, monk seals, sea otters, porpoises, whales and other marine animals. • In April 2001 a federal court ordered the closure of the Hawaii-based longline swordfish fleet as a result of a Center lawsuit. The order also reduced impacts of the longline tuna fleet on the leatherback and other endangered sea turtles. • In May 2001 the Center filed suit under the Endangered Species Act and the High Seas Fishing Compliance Act to prevent tuna and swordfish fishing vessels that were relocating from Hawaii to California from continuing to kill leatherbacks. • In August 2001 the Center filed notice of intent to sue the National Marine Fisheries Service for its failure to protect endangered sea turtles and marine mammals from drowning in large numbers in the California drift gillnet fishery for thresher shark and swordfish. • In June 2002 the Center filed suit to halt an experimental swordfish longline fishery in Hawaii that was authorized to kill 117 threatened and endangered sea turtles, including leatherbacks. • In December 2002 the Center filed suit over the federal government’s failure to close portions of the California drift gillnet fishery during an El Niño year. During these weather conditions, loggerhead turtles are more abundant along California’s coast and more likely to get entangled and drown in gillnets. • In August 2003 a federal court ruled that the California-based longline fishery was violating the Endangered Species Act and that U.S. vessels in international waters are required to consult on impacts to sea turtles. This resulted in the shutdown of the California-based longline fleet operating in international waters.